Requirements set out in the duties contained in Health and Safety at Work (Jersey) Law, 1989 include reference to the qualifying term "so far as is reasonably practicable" which has been interpreted by the courts in a consistent manner whenever they are used in health and safety legislation. The term "reasonably practicable" is a narrower term than "physically possible" and allows economic considerations to be taken into account as one factor, with, for example, time or trouble, to be set against the risk. 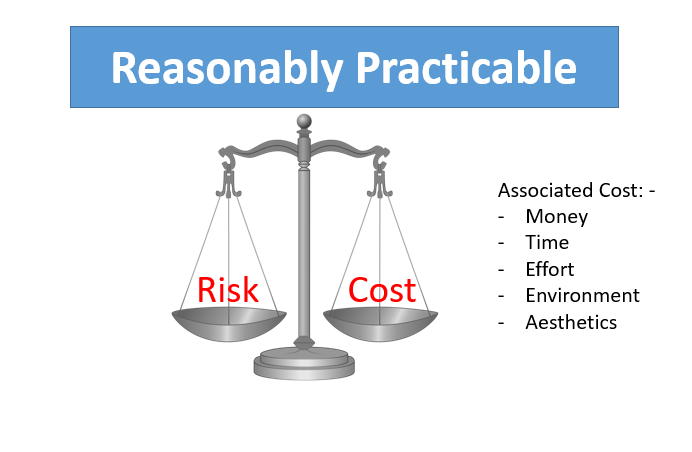 Where it is shown that the risk is insignificant compared to the costs involved, the measures required to overcome the risk may not be considered to be "reasonably practicable". "So far as is reasonably practicable" is a judgement in which the quantum of risk is weighed against the cost to eliminate or reduce the risk. Where the risk is high, then the resources used to overcome that risk may also be considerable.